An impression of the future races by an echo of the past. This is Electra, the InterCity express locomotive of the 1990s and the train that will carry British Rail's prestige into the next century. Electra is an 80-tonne, 6300hp electric locomotive capable of running at speeds of up to 225km/ph (140mph). Thirty-one Electras are currently on order from GEC a cost of £35 million. They will take over from the InterCity 125s on the Kings Cross to Edinburgh route when it is electrified, hauling 9 new Mark IV coaches in push/pull operation. Up to 35 minutes will be cut from overall journey times bringing the fastest schedule between the two capitals down to as little as 4 hours. Uniquely, the Electras have differently shaped cabs at either end - one blunt and one streamlined. During daytime operation on high speed push/pull expresses the streamlined end will always be furthest from the carriages. 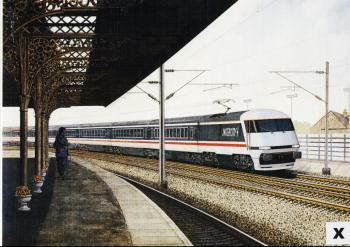 At night the locomotive will be detached, and used, blunt nose leading, on trains which have a lower speed requirement. "The best news for British Rail in 25 years" was how chairman Sir Robert Reid welcomed the government's 1984 green light for BR to go ahead and electrify the East Coast Main Line. The project is Britain's longest building site, covering the 390 route miles from Hitchin, where the Kings Cross suburban electrification stops, to Edinburgh plus Doncaster to Leeds. Costing more than £300 million - a sum which takes in the new rolling stock - BR has a monster shopping list which also includes 25,000 catenary masts, 60,000 individual pieces of steel, 1,100 miles of contact wire and 160,000 cubic metres of concrete for foundations. On the credit side is a faster cleaner service that will attract more passengers. An all-electric East Coast route will also save £80 million on maintenance each year, improve rolling stock reliability by 50 to 80% and cut fuel costs by a quarter. Good news all along the line, in fact. Already the scheme is racing ahead and electric trains reached Peterborough two years early. The first Electras are due to appear at the beginning of 1988, and by October that year a full electric service will run between Kings Cross and Leeds - over a year ahead of schedule. Here in celebration of 40 years progress by British Rail is an image that combines past, present and future: Electra, decked out in the new 'swallow' livery introduced in 1987, races by the carefully preserved delicate Victorian ironwork at Retford station with the InterCity express bound for the 21st century.